Direct mail has been around forever. Can you remember a time when you didn’t receive a letter directly to your home? Most of us have fond memories of waiting for the post to arrive and for an important letter to be pushed through the letterbox by the iconic mailman. Many people are of the opinion that modern technology has rendered direct mail useless. With the huge advance of marketing techniques online, some businesses have shunned the direct mail marketing method in favour of new practices. Despite the seemingly large drop in use of direct mail, it is still used by a number of large organisations today in order to generate targeted sales leads for marketing, because of the great success that companies have had with it. Direct mail has quite an interesting history. This form of mail was utilised throughout history, in several different areas around the world that you probably never even knew about. The first known example of direct mail was actually as far back as 1,000 BC in Egypt. A local man used papyrus to let everyone know that he was offering a reward to anyone able to return his lost slave. The most amazing thing about this first example of direct mail is the fact that it can still be viewed in a museum in the UK. Elsewhere, Babylonian merchants were inscribing what they had for sale on materials like brick and stone, and distributing them to potential buyers in neighbouring areas. With the time and effort it took to inscribe and distribute these heavy items, it’s no surprise that this form of direct mail never really caught on anywhere else. One of the biggest issues direct mail had in the way of gaining popularity and growth was the fact that in those times, people were generally illiterate. 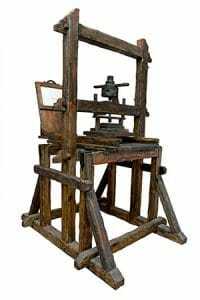 For the most part, it was only the extremely rich or religious who were literate, until 1440 when the printing press arrived on the scene. After that, the first literary craze – The Bible – was printed en masse, meaning that reading and writing was able to truly catch on, along with direct mail. The sophisticated form of direct mail came around 40 years after the invention of the printing press, when William Caxton printed marketing leaflets enabling potential customers to order from his London-based printing press business. 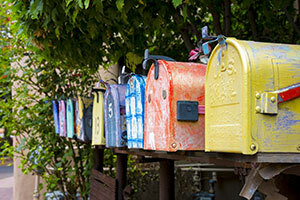 This marked the beginning of the growth of printing and distributing direct mail on a large scale. Direct mail became popular in Europe quite quickly, but it was a brilliant man named William Penn who first introduced it to the colonies. Penn, the founder of Pennsylvania, created a leaflet in the late 1600s that was translated to German and Dutch. This leaflet led to a huge amount of Europeans immigrating to Pennsylvania. Direct mail was around in various shapes and forms throughout history, but it was the 1800s that truly transformed the technique and technology and brought it to the form we see today. Aaron Montgomery Ward could be described as the king of direct mail because of his influence on its transformation. In 1872, Ward created a general merchandise mail-order catalogue that went on to completely change worldwide catalogue shopping. Richard Warren Sears took inspiration from the booklet created by Ward and came up with the famous Sears catalogue. This catalogue meant that consumers worldwide could now have access to a huge selection of high quality goods that were previously difficult to come by. Now everyone, everywhere, was able to purchase a huge selection of items through the post, truly bringing direct mail to the mass market. Sears included images and information, and is still around today. The 1970s brought colour images and an advance in graphics, which only served to increase the sales power of direct mail marketing. Direct mail now is completely malleable and able to be personalised and printed digitally. So, although we are indeed in the digital age, direct mail is still very much a huge part of our marketing culture due to its measurability and the personal touch it provides.